Precious metals were mixed Wednesday with gold and platinum closing slightly higher and silver and palladium finishing a bit lower. Gold for April delivery rose $1.10, or less than 0.1%, to settle at $1,315.10 an ounce on the Comex division of the New York Mercantile Exchange. 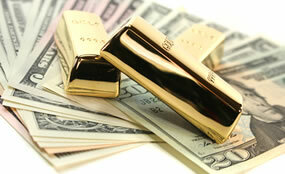 Gold futures ranged from a low of $1,308.10 to a high of $1,321.70. They climbed 0.2% on Tuesday and shed 0.5% on Monday. Elsewhere, silver for March delivery gave back 3.8 cents, or 0.2%, to close at $15.652 an ounce. Silver futures traded between $15.52 and $15.80. They ended flat on Tuesday and declined 0.8% on Monday. "Buying interest in both metals [gold and silver] was limited by a higher U.S. dollar index today, as well as firmer U.S. stock indexes that hit two-month highs," Jim Wyckoff, a senior analyst at Kitco Metals Inc., said in a report. "However, the sellers remain timid due to the near-term bullish technical postures for both gold and silver." April platinum added $2.20, or 0.3%, to $791.80 an ounce, ranging from $787.40 to $796.50. Palladium for March delivery declined $2.80, or 0.2%, to $1,372.60 an ounce, trading between $1,370 and $1,388. They logged a record settlement of $1,375.40 an ounce on Tuesday. Gold added $2.80, or 0.2%, to $1,312.80 an ounce. Silver fell 11.5 cents, or 0.7%, to $15.695 an ounce. United States Mint bullion sales picked up by a combined 2,000 ounces in American Eagle and Buffalo gold coins and by 125,000 ounces in American Silver Eagles.